The gathering held today will hear testimonies from Iraq, China, Cambodia, Brazil, and Hong Kong. A contribution to the Synod on Youth taking place in the Vatican. Overcoming a sociological and political view of the world of young people. Faith in Jesus Christ and the company of adult missionaries a path to exalt the qualities of young people and lead them to become builders of a new society. Rome (AsiaNews) - "Young people who resist. 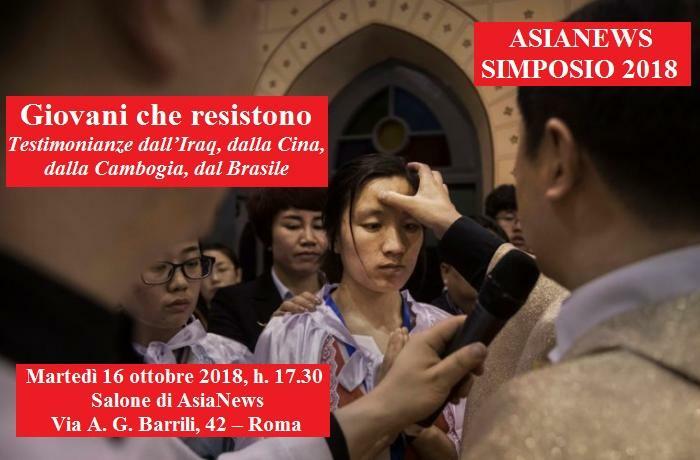 Testimonies from Iraq, China, Cambodia, Brazil ": this is the title we gave at the 2018 AsiaNews Symposium, which takes place today in the AsiaNews Hall Rome, in Via A. G. Barrili, 42, starting at 5.30 pm. Participants at the gathering include: Fr. Paul Thabet Mekko, priest at Karamles the first priest returned to the Nineveh Plain (Iraq), after the defeat and the expulsion of the Islamic State; Fr Luca Bolelli, PIME missionary in Kdol Leu (Cambodia), involved in evangelizing young people in an almost completely Buddhist society that is rising from the ashes of the Khmer Rouge; Giovanni Pang Chun Yu, Salesian educator in the megalopolis of Hong Kong; Fr. Marcelo Farias dos Santos, PIME missionary for Japan, who speaks of how his missionary vocation has blossomed. Today's meeting hopes to be a contribution to the Synod on Youth which is taking place in the Vatican from October 3 to 28. It is a somewhat counter-current contribution: before and during the Synod we have been bombarded with statistics on the religiosity of the young, on their attendance at Masses and Christian gatherings, on their isolation from families and from the adult world. This sociological view does not satisfy us, nor does the purported emphasis on the "participation of young people in the life of the Church", reduced to a political question of greater spaces to be conquered, of freedom to defend, as if the Church were an institutional skeleton, old and suffocating, which oppresses young people and adults. The testimonies we present at the Symposium are young people who found their strength and joy in their faith in Jesus Christ (not in sociology or politics). They have found in the company of the Church a fraternity that exalts their qualities: a momentum of ideals, courage, the desire to build the future. At the same time, the wisdom of the adults who accompany them helps them avoid becoming slaves not only to social networks, but also to dominant public opinion, making them capable of being builders of the society to which they belong, often marked by war, misery and anonymity. Some commentators say that the Synod that is being held in the Vatican is keeping an eye on the West and its problems and has little or no universal vision. In the West we are used to seeing young people marked by a constant searching and individualism, by virtual friendships and loneliness. In the East it is no different. Yet the situations we present at the Symposium, where war, underdevelopment, life in the megalopolis dominate, illustrate that something new is growing, that faith in Jesus Christ shapes the lives of young people, their vocational prospects, their commitment to their society no matter how destroyed it may be. This "newness" of the East, which is faith lived and witnessed, can also inflame the West.